Tiger Cubs <飛機> actor Joe Ma (馬德鐘) and his wife Karen Cheung (張筱蘭) invested a seven-figure sum to a western restaurant that they have recently opened in Whampoa of the Kowloon City District. Many friends in the industry including Anne Heung (向海嵐) and Eva Lai (黎燕珊) went to the grand opening to show their support. Joe and his wife, both food lovers, have invested in a number of restaurants and bars over the years. Last year, the couple opened a Japanese restaurant in Tsim Sha Tsui to great success. On his new restaurant, the 49-year-old actor said he’s always had an interest in making Italian food, and would love to make some dishes himself if he had the time. Due to his back-to-back filming schedules—a drama in Mainland China and another upcoming TVB drama Leaping Across the Lifeline <跳躍生命線>, he’s going to need his wife Karen to help manage the restaurant business. The paparazzi hasn’t been very nice with celebrity kids. 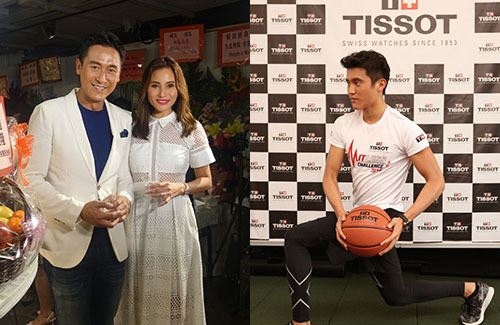 Earlier, Wayne Lai’s (黎耀祥) own 19-year-old son was criticized for flaunting his wealth. Fortunately, Joe’s son hasn’t been targeted yet. “You can’t accuse him for flaunting his wealth because I don’t have it!” Joe joked.